Now that you’ve drummed up some business as a freelancer, a web design and development shop, or a creative agency, it’s time to start collecting money owed. Using a well designed invoice is the easiest way to bill your clients. If you use an accounting program like QuickBooks or an online project management application like Intervals, they will create an invoice for you. However, if you were wondering how to create an invoice on your own, take a look at our simple invoice template below along with the details of what should be included on an invoice. 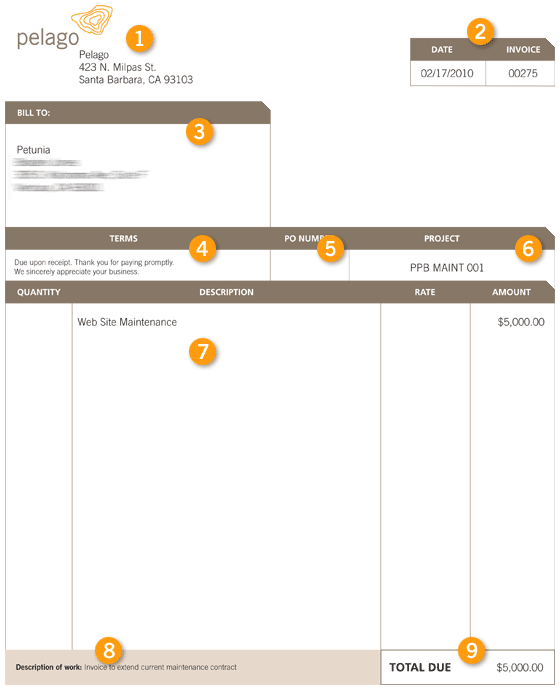 This project invoice template is based on a free invoice template from Adobe. Include your logo and address in this space so the client knows who is invoicing them and where to send the check. The date is important as it tells the client when the invoice was issued. The invoice number is used by both the client and the designer to reference the invoice. Both of these fields are important for getting paid on time. This is usually the part you see sticking out the plastic window on the front of the envelope. Most invoices are sent electronically these days, however, this information is still important to avoid any confusion. These can be whatever you want them to be, though we recommend issuing all invoices as due upon receipt. Useful if your creative agency commonly issues purchase orders. This field is rarely used in web design and development. Include the project name to differentiate this invoice from one the client may have already received from another project. It is common to work on several projects for one client. This field helps simplify billing. This itemized breakdown details what is being billed. In the case of this example, the invoice was for the total owed on a design and development time and materials maintenance contract. These line items could also include hours worked, milestone payments on a flat-bid, or project expenses. A description of work can be useful for summarizing the invoice for the client. The invoice total is the most important number on the invoice.